Norwalk, OHIO (June 24, 2018) – Mopar Express Lane Dodge Charger R/T driver Matt Hagan, seeking a bit of redemption after first-round exits in the previous two events, began Norwalk eliminations with back-to-back battles against DSR teammates. First up was Tommy Johnson Jr., with Hagan’s quick reflexes helping to score a close holeshot win by an ultra-thin margin of less than one-thousandth of a second. Hagan was again first off of the starting line in an all-Mopar Dodge quarterfinals fight, pulling away to defeat Jack Beckman with a 4.010-second at 322.27-mph pass. The two-time world champion led from start to finish stripe in the semifinals, reeling off a 3.981 E.T. to defeat J.R. Todd and earn all-important lane choice against No. 1 qualifier Courtney Force in his fourth final round of the season and 51st of his career. 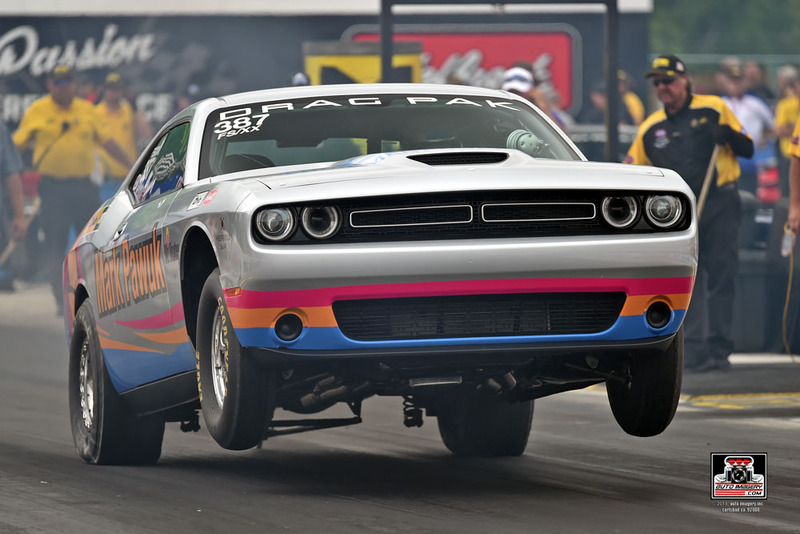 Hagan saved his best reaction time for the money round, a 0.033-second mark that gave him a jump over Force that he would never relinquish, recording a winning 4.094-second at 288.21-mph pass to his opponent’s losing 4.220 at 227.54-mph effort. “Super proud of my guys,” said Hagan, who picked up a win earlier in the year at the season-opening event in Pomona. “These cats have been working hard and we’ve obviously had a track prep change that we needed to adapt to and it took (crew chief) Dickie (Venables) a few runs to get there, but that’s why I love him and I’m glad he’s in my corner. He always figures it out. “We had a good, solid car all weekend. Qualified well, went down the race track pretty much every lap. It hazed the tires out there and I was legging it out, but it’s the finals, man. 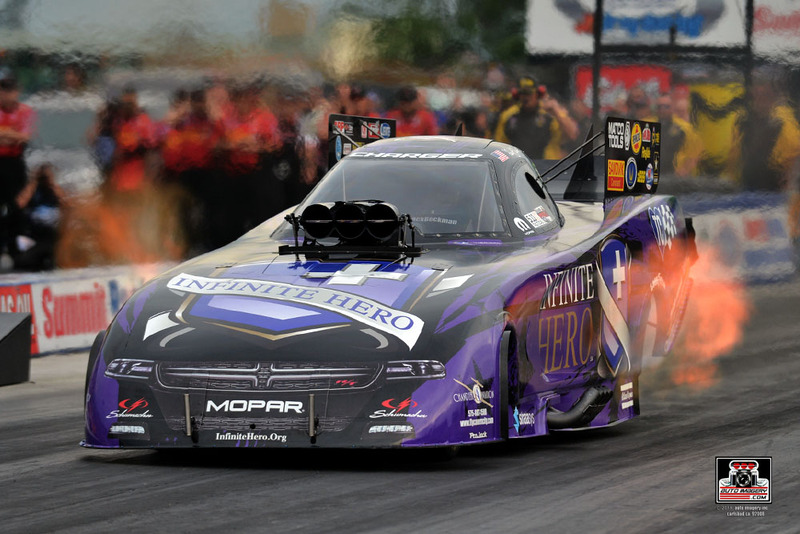 With the Norwalk win, Hagan was able to advance from sixth all the way up to a tie (with teammate Jack Beckman) for second in the Funny Car points standings. Sunday’s victory was Hagan’s second of the season, 28th of his career and first-ever at Norwalk. After a qualifying performance which positioned him in the top half of the field, Antron Brown drew Blake Alexander in the first round. 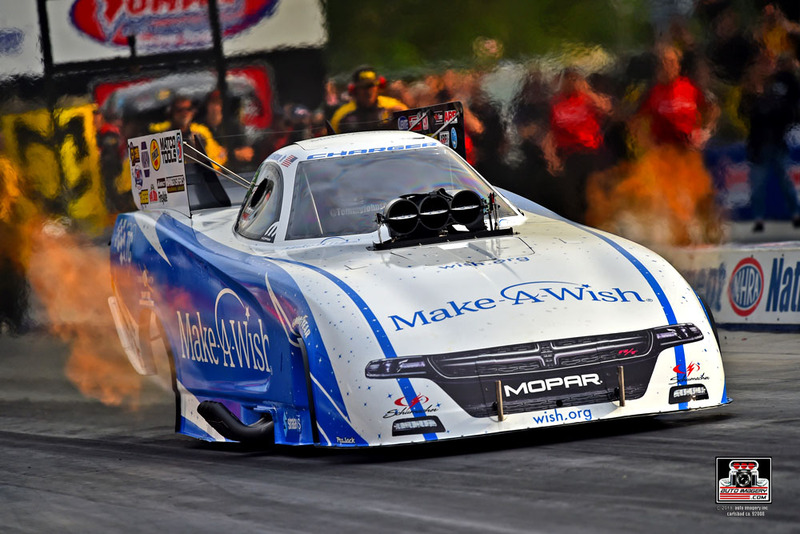 The 2014 Norwalk event champion had a one-to-one record against Alexander prior to lining up on Sunday morning at the 12th annual NHRA Nationals. Both drivers were quick on the tree, with Brown earning a slight advantage (0.065 vs Alexander’s 0.068-second reaction time). Alexander took the lead almost immediately and raced down the track in 3.802-seconds, narrowly defeating Brown’s 3.808-second pass. Leah Pritchett faced Doug Kalitta in the opening round of eliminations on Sunday morning. 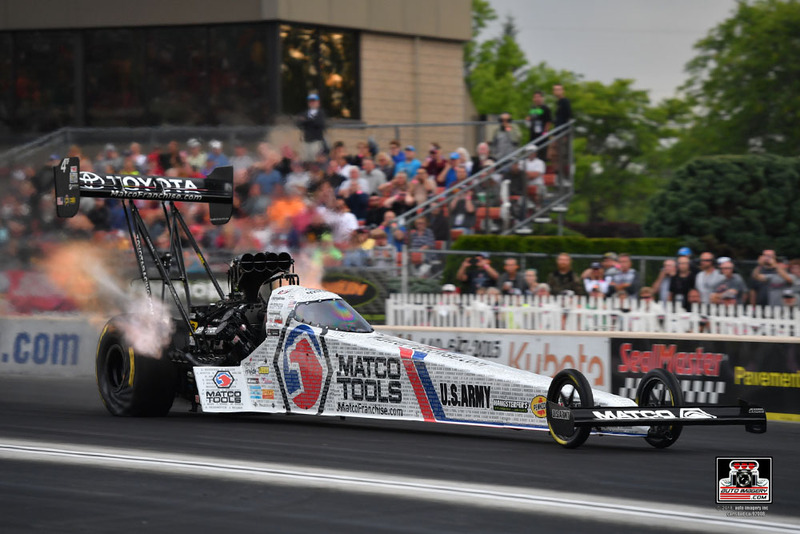 Kalitta had a slight advantage on the launch and led for nearly the entire span of the 1,000-foot stretch, but Pritchett charged hard in her Mopar-powered FireAde machine, chasing Kalitta down at the far end of the track to set off the win light. Her 3.794-second effort held up to be the second-best of the session. 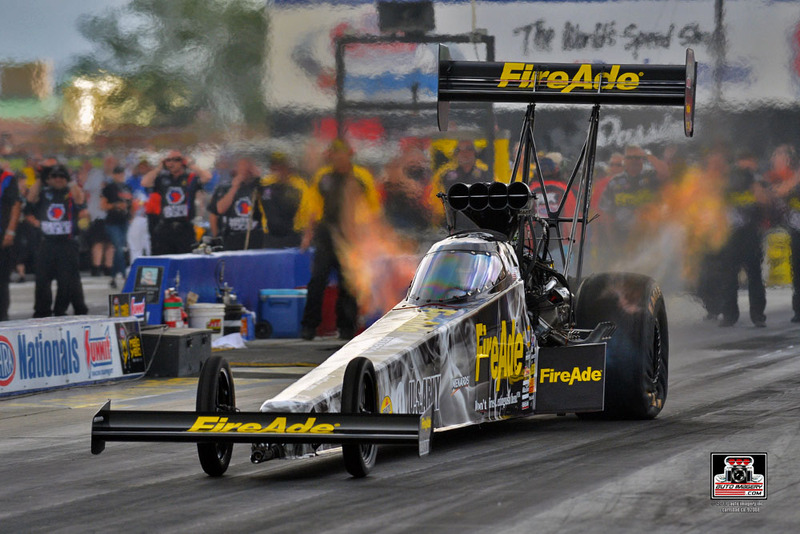 The six-time Top Fuel winner powered to her best run of the weekend in the quarterfinals to claim the upset win over No. 1 qualifier Clay Millican and earn lane choice over semifinal opponent Blake Alexander. Pritchett was first on the throttle, but encountered issues just past halftrack. The 2018 Atlanta winner pedaled the throttle and harnessed her FireAde machine enough to recover before giving way to a fireball, enabling Alexander to claim the win with his clean pass. “We started race day with all new information. We weren’t able to take a lot from qualifying. We made wholesale changes on Saturday night, and with that confidence coming into Sunday, the FireAde team output exactly what we input. We had two awesome and consistent runs. It’s been a while since we had some real tight racing like that where the car was on point, I was on point, the team was on point, and we had no mechanical malfunctions. Last week’s Top Fuel winner (Bristol) started race day from the fourth seed, pitting the veteran racer against newcomer Kyle Wurtzel in round one. 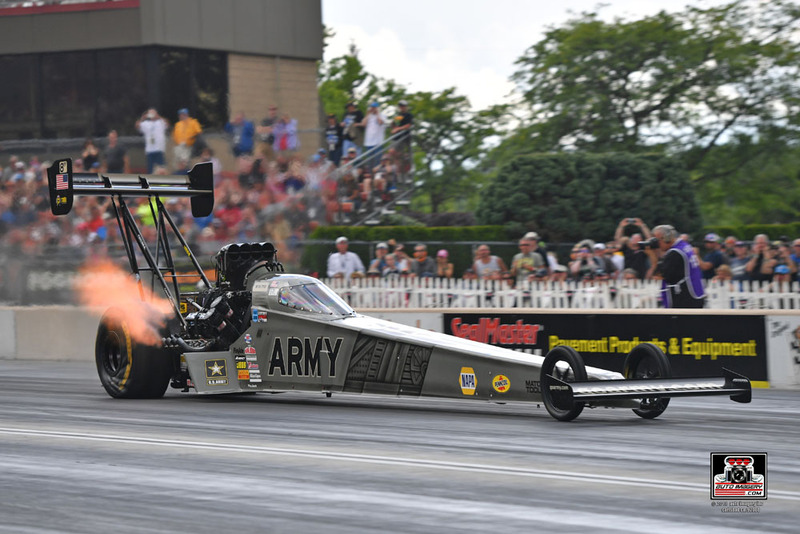 Tony Schumacher was able to overtake Wurtzel near the 330-foot mark and wheel his Mopar-powered U.S. Army dragster down the track in 3.807-seconds, carrying the lead the rest of the way. Schumacher, the inaugural Top Fuel winner (2007) at the Norwalk facility, lined up next to Blake Alexander in the quarterfinals. Schumacher was hoping to avenge teammate Antron Brown’s first round loss to Alexander, but a lengthy starting line tree caused Schumacher to have an uncharacteristically delayed reaction time (0.146-seconds). The Army car raced down the track in 3.779-seconds, but Alexander was able to steal the holeshot round win with his 3.798-second pass. “Fast” Jack Beckman scored an upset in the opening round, taking his No. 11-qualified Infinite Hero Foundation Dodge Charger R/T past the higher-seeded No. 6 machine of Tim Wilkerson. Beckman, a three-time champion at Norwalk, easily claimed the round win with a 4.047-second at 319.07-mph run after Wilkerson smoked the tires. 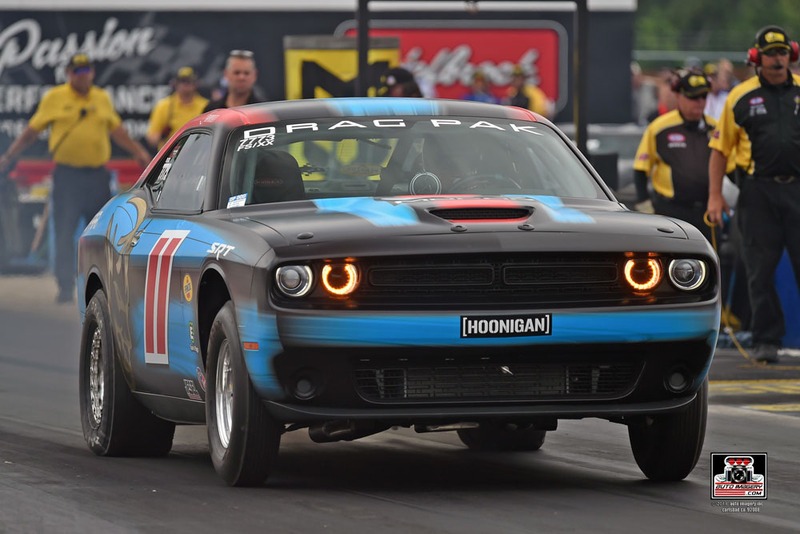 The defending Norwalk event winner trailed off the starting line in an all-Mopar Dodge DSR quarterfinal matchup against Matt Hagan. Beckman regained the lead briefly at the 60-foot mark but ultimately was unable to drive past his teammate for the round win. Beckman leaves Norwalk still ranked second in the standings (tied with Hagan) and as the winningest Funny Car driver in the facility’s history. "We're still in a brand-new car. I think it's the fourth race for this new chassis, brand-new clutch in our car, the pressure plate and the (recent changes) in track prep. You hate to say that you're testing, but the definition of testing is trying to zero-in on a combination that works, so we're testing. "We had a phenomenal car earlier in the year. We could not seem to qualify any worse than fifth, and now some races we're struggling to qualify in the top-half, but we seem to be a very intelligent race-day crew. We seem to be able to beat out round wins no matter where we qualify. Now, if we qualify better, we'll have more favorable race day pairings. We'll stay tomorrow (in Norwalk) and test, and we will keep zeroing in on this thing. The changes that we made with the other clutch and the other chassis have different effects on this one, but every run we make we get data and we get better." Ron Capps and the NAPA AUTO PARTS Dodge Charger R/T Funny Car team entered the 12th annual NHRA Nationals fresh off of a trip to the winner’s circle from the previous event. Picking up right where they left off, the Rahn Tobler-led team dominated throughout qualifying. Two days of persistent rain showers meant nitro teams were permitted only two shots at the race track before race day fields were set. Capps collected bonus points during each session, running second-best in round one, and “best of class” in the second session. Capps, a three-time Norwalk runner-up, kicked off his 500th professional race day start with a matchup against No. 15 qualifier Jeff Diehl. Capps drove away with the immediate round win when Diehl stood on the gas early and fouled out. In round two, Capps faced J.R. Todd. 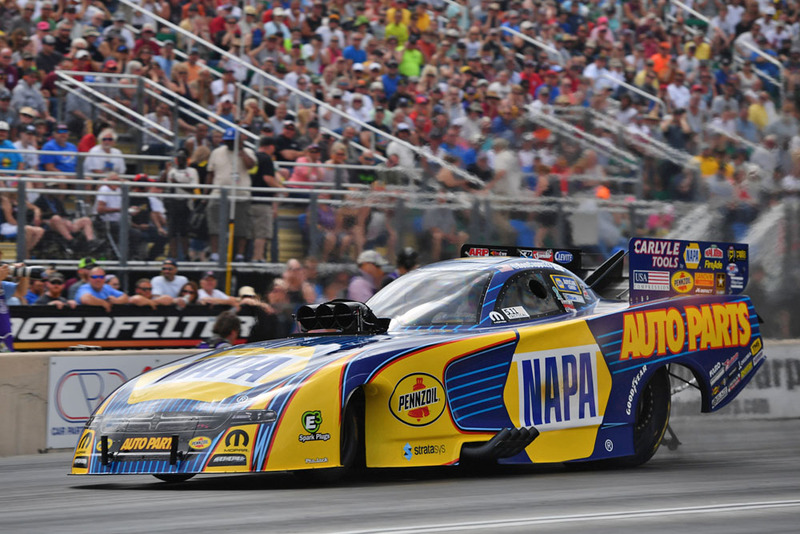 The NAPA machine went up in smoke almost immediately, ending Capps’ chances at winning Norwalk’s coveted ice cream scoop trophy. Beginning eliminations from the No. 14 position, Make-A-Wish Dodge Charger R/T pilot Tommy Johnson Jr. faced off in an intra-squad battle with fellow DSR stablemate Matt Hagan. 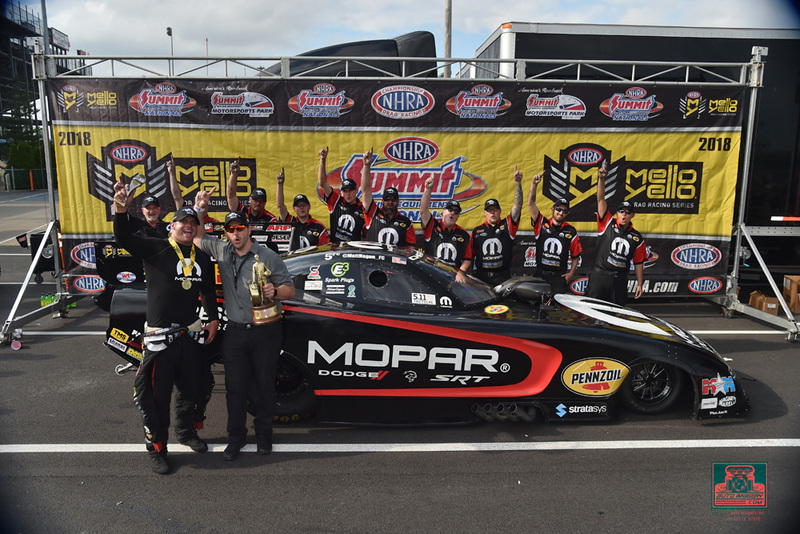 Johnson overcame his teammate’s slight edge off the starting line (a 0.071-second reaction time to Johnson’s 0.075) to put the nose of his Mopar Dodge out front at the 660-foot mark, but Hagan surged ahead to beat Johnson's quicker 3.990-second effort to the finish by a razor-thin margin of about five inches.